If there’s one goal that the enemy has in mind for Christians, it’s to turn us back into the walking dead we were before we found Christ. It’s to make us ineffective through our lost testimony, and make us fall back into the pit Jesus pulled us out of. Allowing us to move forward in our walk with Christ isn’t an option. One failed Christian is worth far more than one unsaved in his hands. A failed Christian he will hang on his wall like a trophy! Once defeated, that Christian becomes his greatest weapon in the battle against Christianity. And because of that, we will be tempted, we will be tried, and we will fail sometimes. 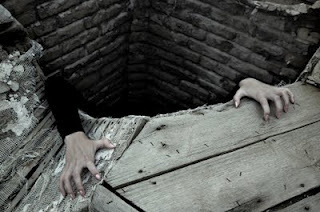 The trick is to call out to God, and get out of the pit! There seems to be quite a bit of hating on the past being done lately. I see posters continuously saying things like “Don’t let the past rule your future”, or “The shadow of the past holds the future hostage.” Having a past that I’m not all that proud of, I can understand how the past can be something we want to forget. But the past has its purpose. Failures produce humility, and humility produces dependence on God. His grace is sufficient to cover even our yucky past. Isaiah 51:1 says for those of us that want to follow Christ, we need to look to the rock from which we were hewn (Christ) and to the hole of the pit from which we were dug (sin). Isaiah goes on to say “Look to Abraham your father, and to Sarah who bore you (that’s in the past); for I called him alone, and blessed him and increased him.” From what you were, which was in the pit, and because you answered His calling, you will be blessed and increase. He goes on to say that He will make our wilderness like Eden, and our desert like a garden, flourishing and full, and joy and gladness will be found in it. Yes the past is ugly, and uncomfortable, and we wish we could bury it and walk away from it. But it has its purpose. You wouldn’t be who you were today had your past not been effective in breaking you. This too was God’s plan. Who do you think makes the pits for us to fall into? There has to be a stopping point in our sin walk somehow, and those final pits we land in are His way of causing us to look up. Trust in the Lord – that’s what it’s all about, learning to lean on Him. On our own, we’d go back to the pit. But praise God, He did put us on a rock (Christ) and established our steps. Now we walk away from the pit!